This month you may have noticed shriveling of some stems on your clematis, while others of us have been so unlucky as to experience a dramatic demise of the entire plant shriveling and turning black in a week. These symptoms are typical of a disease called clematis wilt. These dramatic symptoms most often manifest just as the plant is about to flower, typically striking the flower buds and new growth first. In my research, I have found 2 fungi credited with causing this theatrical demise, Phoma clematidina and Ascochyta clematidina. These pathogens enter the vine’s vascular system and clog the fluid-carrying tubes causing all parts of the plant above the clog to wilt as if it needs water. Luckily, this disease does not attack the roots. Simply prune out the affected stems or trim the plant to the ground. New shoots will emerge and some cultivars will bloom again in the same season. Be sure to disinfect your tools after pruning the infected plants to avoid transmitting the disease to other plants. Once the plant has established heavy, tough stems the problem appears to lessen. In other words, the plant can outgrow the disease. These symptoms have lead some gardeners to call the disease “juvenile wilt disease”. These fungi appear to primarily attack early-season, large-flowering hybrids. If you would like to avoid the trauma of seeing your entire clematis shrivel up and die, plant small-flowered species like Clematis montana, C. macropetala, C. alpine, and C. viticella. 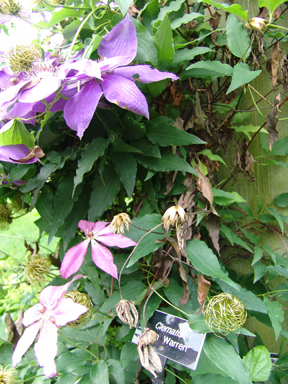 Great information for this time of year, when newly planted Clematis are starting to flower. Are there any fungicides that homeowners can apply to prevent this disease or that needed to be applied to prevent reinfection after the diseased tissue has properly pruned off the plant? After pruning disease plants, some references recommend fertilizing and watering your plants well. To prevent return of the disease be sure to sanitize your tools after each cut. Do not compost the infected growth as that will not destroy the fungus. As preventive measures, sight your plant in an appropriate place and be sure it remains well watered. Avoid creating stress for the plant. Some references recommend a systemic fungicide to be applied in late spring. These treats seem unnecessary because the disease does not cause death of your plant and will re-sprout after removal of infected growth. Once the plant is well established it will out grow the disease. To avoid the disease all together plant small flowering cultivars, which are resistant. I thought “macro” meant big and “petala”meant petal, referring to large-flowered clematis. I thought the macropetalas were most commonly infected with these fungal diseases. You are correct. 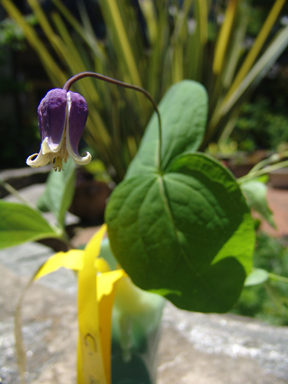 Macro and petala do imply that C. macropetala is a large flowered clematis. As species clematis, it does have a larger bloom than other species clematis. The clematis most susceptible to wilt are the large flowered hybrids, not the species clematis, which all have smaller blooms than the hybrids. my clematis rebecca has flowered well ,but now has gone brown and looks very sick ! what can I do ? The best thing to do is cut it to the ground and it may re-sprout a little this year, but next year it may come up and be absolutely fine. I have a potted General Sikorski clematis which was looking really healthy and putting out lots of green foliage and buds. Normally doesn’t flower until a bit later but like other plants, was growing earlier because of the nice weather and I must admit I didn’t prune much this year. (Does say only to prune lightly in spring). Now the top section of growth has gone soft and flopped over. I keep cutting the floppy bits off in the hope that the rest will be ok and still flower. Some of the leaves are going a bit crispy but not as the description of clematis wilt. Perhaps I am just in early stages? Hasn’t done this before and I have been watering well. Seems such a shame to have to cut it all back as I won’t get the flowering in May. Does say it should flower all summer but it doesn’t. If I cut it back now more radically, will I get a later flowering this year? My plant is at least 3 years old and growing but the leaves are turning yellow can you help me? It sounds like you do in fact have Clematis Wilt. 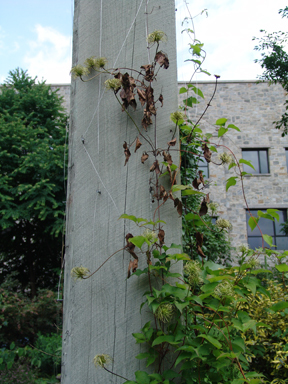 Clematis Wilt is unpredictable and does not necessarily repeat on the same plant year to year. The best thing to do is to cut it to the ground and remove the infected tissue. It will resprout, but will most likely not re-flower this year.